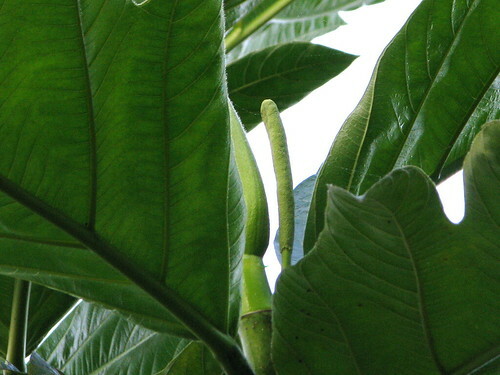 This entry was posted in Moraceae and tagged Artocarpus, Artocarpus altilis, Breadfruit, inflorescence, Moraceae, National Tropical Botanical Garden, pistil, stigma, stipule. Bookmark the permalink. Great breadfruit flower pictures! Maybe you’ll let me use them for my economic botany class? Oh, and Captain Bligh was successful! He got a new ship, returned to Tahiti, got the breadfruit and transported it to the Caribbean area, although it was never enthusiastically adopted as a food plant. I’ll gladly let you use the pictures for your class, Phyto. You can download the originals from Flickr. Nice writeup and lovely photographs. The fruit and leaves on your tree look more like breadnut, Artocarpus camansi, a closely related species native to New Guinea, and ancestor to breadfruit (Artocarpus altilis). If your fruit stays spiny as it matures, and is full of large seeds, that look like chestnuts, it is definitely breadnut. The seeds are quite tasty and can be boiled or roasted. This species was collected in the Philippines by the French and spread throughout the Caribbean and other tropical regions, in parallel with the distribution of the seedless breadfruit from Tahiti by Bligh. The tree was sold to us as breadfruit when we were new to Panama, and I never thought about checking out its identification. Well, well. It certainly bears watching. A thought – is there any difference between the two species in the color of the stipules when they drop off? The ones from this tree are reddish just before they drop off (here) and when they reach the ground, as here and here. I certainly appreciate your taking the time to comment on my post. The stipules on both species look the same. 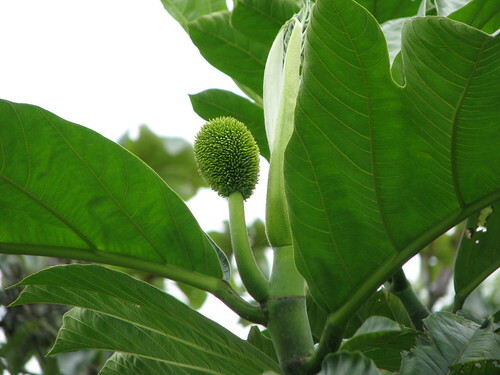 See our website (http://www.breadfruit.org) for more information about breadfruit (and breadnut). Wonderful green photos! I’m interested to hear it’s in the same family as Osage Orange. I took some photos of that yesterday. Those osage oranges – we called them hedgeapples when I was growing up – are really something, aren’t they? It tickled me when I learned that they were in the same family as breadfruit. When I think about the fruits, though, it makes perfect sense. The one thing I’d do today if I came upon an osage orange tree or shrub is look for the stipules and the stipule scars. Fascinating feature, I think. Are you going to post your photos? Great photos and an informative post. I too find it interesting that breadfruit and hedge apples are related. From a human prospective, hedge apples have no known uses other than as projectiles. Thank you, Diane! I’m so glad to know that the breadnut is as edible as the breadfruit. This tree is still pretty young and the nut that it produced fell off before it matured. I’m hoping for a real crop this year, and I cook it just the way you described. Thanks again. WE HAVE SO MUCH OF THESE ‘BREADNUT’ TREES IN MY AREA. I WOULD LIKE TO KNOW IF ANYONE WILL LIKE TO BUY THE NUTS. Olawale, Where do you live? If anyone who reads this post is interested in buying nuts from you, they can leave a comment here. Hi, my name is Robert. You’ll be surprise to learn that there is a growing market for breadfruit eaters around the U.S., and nobody has ever noticed to start supplying this market. Almost every Samoans eat breadfruit. Other than Samoans, other almost every Pacific Islanders eat it too. The problem is, there is not yet a steady supply for this market. By the way, the flower, which turns reddish at some point and fall right before the breadfruit appears on the tree, is different from the nut, which is inside the breadfruit itself. I just wanted to say that you don’t eat the flower. And notice that not all breadfruit species have a nut inside. Where I am from (an island), there are about a dozen species or more. They all have different tastes, appearances, stems and branch growth structures, and also leaf shapes. Thank you for your interesting comment. I had not realized what a variety of breadfruit species there were. It would be great if the US market opened up to breadfruit. It does sound delicious. Our tree is still young, and last year’s single fruit did not mature. I’m looking forward to a real production this year. Hi my name is adjei i am a final year student of kwame nkrumah university of science and technology, it will interest you to know that i am working on breadfruit as my project. Yes, that is most interesting, Adjei. It sounds like a great idea. I wish you the best of luck with that. Hi Mary. I was working on some information for a blog post on my FB work page about Breadnut when I came across your entry here. You might find my post interesting reading and useful for getting to know your Breadnuts better. I have been eating and enjoying them all my life. What is the best way to cook the male flower? Any ideas? Hi, I’d just like to ask a question 🙂 Do the flowers fall after they’ve turned to dark brown with age? Why is this so? I will very much appreciate your reply 🙂 Good day!